Obviously you’re using the internet to seek information on how to get rid of bats from your attic, house, and home. You have come to the right place. VaMoose Varmint! 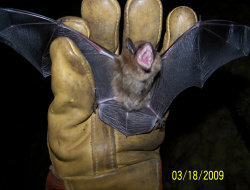 Wildlife services is a professional company that can provide you the most effective ways to perform bat eviction. VaMoose Varmint Wildlife services have been providing bat solutions for 10 years. Paul and Shaun provide service solutions in south west Michigan, and Dan getting rid of bats in Northern Lower Michigan and in the Upper Peninsula of Michigan. So how do we get rid of bats in a house, it may be as simple as opening a window or door. But if the bat in the house has possibly come in contact with any persons in the structure, it should be tested for rabies at a local heath department. If you’re afraid of getting rid of bats it might be wiser to call a professional wildlife control operator. We have the proper safety equipment to deal with these types of problems. If you want to get rid of bats in the house yourself, place a container of some kind, like a coffee can over the bat and slip a heavy peace of paper between the can and wall trapping the bat inside the can, now it is ready for release out side or for rabies testing at the health department. Most of the times for bats in the house the callers don’t know where it is located. This is when the hunt starts. First start looking where the bat was last seen. Bats can hide in some very small places and can blend in very easily. You will have to be very thorough when searching the home. Example: look behind objects hanging on the wall, light fixtures, they will crawl between clothing hanging in closets, and crawl into any dark spot to hide. If you can not locate the bats it might re-appear later possibly after dark when it feels safe to come out. It is possible to capture the bat in a towel but I would still want to handle the towel with bite proof gloves so the bat can’t bite you through the towel. With a lot of bats flying in house calls the bats are in a spot where you can only capture it by grabbing it by hand, this is where my bite proof gloves come in handy. Bats should be handled carefully as not to injure the bat, so it can be released out side. If the bat must be tested for rabies the bats head can not be damaged. Example: This is not a recommended technique on getting rid of bats; this is just an observation of mine. Many of the bat calls I receive the number one bat defense method the home owner uses is the tennis racket, to kill the bats flying in the house. This tennis racket method is not a technique that is on the top of the suggestion list. I will tell you why. It may be very dangerous to the person or others in the close proximity of where the bat is struck with a tennis racket do to the possibility of rabies transmitting to people through and aerosol. When struck the bats brain matter, blood and saliva can become air born, this is where the rabies virus lives, and the rabies virus can enter via inhalation, mucous membranes and blood stream. So not even being bitten you could unknowingly contract bat rabies. The last bat rabies study I read for Michigan said only 1% of our bats carried the bat rabies virus. In the year of 2007 199 bats were tested positive for rabies and in 2008 70 bats were tested positive for rabies and as of April, 2009 5 bats have been test positive for rabies. Contracting rabies is a small risk, but why takes that chance. Bat specialists come in contact with bats that possibly carry rabies on frequent basis. I have gone through pre exposure rabies shots. Unfortunately its not cheep and its hard to find a doctor that can even get the pre exposure rabies vaccine. We have had several different families that have called us on how to get rid of bat‘s in their house, unfortunately for them they needed to go thru the post exposure rabies shots due to a bat in their house. These post-exposure rabies vaccines are very expensive, on average $3000.00 per series of shots. If you have a large family ouch! Ok enough of rabies we know it’s a serious heath risk. Note to land lords it might be a liability issue with tenants if there is an on going bat issue in the house. So some preventative bat exclusion to your home or building can save a lot of trouble in the future. If you have had one bat in your house or several bats in the house you most likely have a colony of bats living in your home. When I go out for a bat inspection I use ladders and climbing gear to safely inspect roof lines, dormers, vent systems, chimneys and any other possible spots that bats can get inside the structure. A favorite entrance for bats is the sides of dormers where the soffit meets the roof; this is one possible way for bats to enter the attic. Most of the time there will be a construction gap in this location. At these entrances bat droppings or guano will be present if rain or wind has not cleared them away. Staining from their bodies oils around a bat entrance will sometimes give the bats away. These areas may lead to bats in your attic. Once I locate all the entry points I will inspect for bats in the attic. Wearing a full face respirator I go in the attic. Looking for bat guano in the attic may tell me the size and kind of colony. Guano will build up under the roost. Remember I said that I wear a full face respirator. The reason why I do this is for HISTOPLASMOSIS, this is a respiratory disease in humans caused by inhaling H-capsulatum spores that may be housed in the bats guano, which can grow due to the presence of the guano. In severe cases infection results in an acute respiratory illness with flu-like symptoms, and the dissemination of the fungus through the blood stream, which affects other organs. In certain individuals (children or elderly) an acute disseminating form may occur and result in death. So please don’t disturb these piles of guano unless you know how to handle it like a biohazard. At VaMoose Varmint! Wildlife services we will provide bat guano removal. We remove all contaminated insulation and deodorize your attic then reinsulated with new. Some home owners insurance will cover this type of bat damage. Some thing you might want to check out. After finding out the size of the colony we can figure out when and how to get rid of bats. I like to use a one way door method. This lets the bat in your attic out but will not allow the bats back into the attic or home. This method of eviction from the attic is approved by bat conservation international. The most important thing in how to get rid of bat‘s is paying attention to details. All construction gaps larger than a dime must be sealed. You most seal the entire home to prevent re entry of bats. 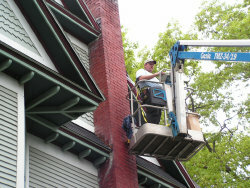 How to get rid of bats by checking chimneys brick and mortar that may be loose leaving gaps. Check for gaps behind and where a chimney goes thru roof lines and seal all gaps and install one way doors if a bat entrance is present. 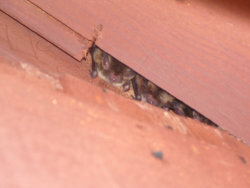 All attic venting systems with gaps or openings must be screened down to one quarter inch to prevent bats in the attic. Here at VaMoose Varmint! We always try to color match any calking, tin work and exclusion work to make it blend in as if we had not had to fix the bat openings. One way doors are left on for about two weeks, to let bats out, then removed and the hole sealed. After the bats have exited through the one way doors the bats will try for several nights to get back in, by looking for another entrance, this is why sealing every thing needs to be done. This is how to get rid of bats. Trapping bats is possible but has it draw backs, the person trapping must handle bat cages exposing them to diseases. The trapped bats can be injured or die due to exposure if not released in a timely manner. Trapping bats, does make the home owner feel relieved because they see the bats being physically taken away, but bats are flyers they have a great sense of direction, so they can find their way back to their the roost. We find it not cost effective in removing trapped bats daily and then drive time to transport the trapped bats hundreds of miles away just for having them come back. The cost to the customer would make trapping bats not practical. I believe bat trapping is not the best way in getting rid of bats. Another method is to use electronic devices; I found them to have very little effect on getting rid of bats, squirrels or raccoons for that fact. I can say I have never been to a house the home owner has said the electronic devices has worked otherwise we would not be there. There is one more how to get rid of bats removal method I would not use is bat repellants. Simply put I’ve seen home owner waste their money on these quick fix gimmicks, in my opinion they did not get the job done or I would not be there. It will cost more in the long run if you don’t do the bat job right the first time. The most effective way to get rid of bats in the attic is through total exclusion, and one way bat doors. This ten year proven method has worked for us time after time. At VaMoose Varmint we can help protect your family and home with proven, good looking and effective bat exclusion work. Keep in mind that Bats also carry fleas, mites and bat bugs and a professional Pest Control company may need to remediate this problem.